Katya Hrichak argues that Catullus’ obsessive returning to the topic of his own loyalty to Lesbia, and how she has disappointed him by failing to reciprocate, shows that to him passion is the most important thing in an affair, even above trust. quam mihi, non sī sē Iuppiter ipse petat. in ventō et rapida scrībere oportet aquā. vērē, quantum ā mē Lesbia amāta mea est. quanta in amōre tuō ex parte reperta meā est. 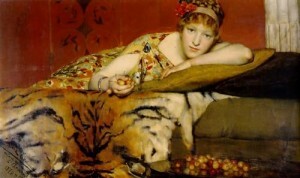 Image: Sir Lawrence Alma-Tadema, “Cherries” (1873). Source: Wikiart.